The room has full bathroom and it’s suitable and comfortable for couples. We introduced comfortable sofa and pocket coil mattress of US luxury bed “Simmons”. 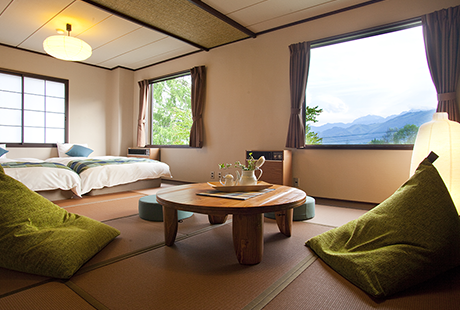 As Japanese room (6 tatami mats) and living room are joined, relax in living room and sleep in the mattress on Japanese room will make couples satisfy. 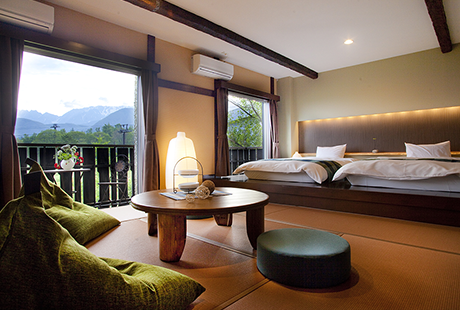 There is a Hakuba mountain view terrace in the Northern Alps side. You can get the magnificent view of great mountains of the Northern Alps such as Mt. Kashimayari, Mt. Goryu, Mt. Hakuba, Mt. Karamatsu, Mt. Hakuba-yari, Mt Shakushi and more. This is a spacious room and popular for various guests such as families, groups and couples. Wash-basin is separated from bathroom and it has functional usability. We introduced pocket coil mattress of US luxury bed “Simmons”. Semi-double bed, with width of 120 cm, is comfortable for large person. The room is in the lower floor and bed has the height, so recommended for elderly person. Beautiful and stylish room bearing the names of the Northern Alps. We introduced cozy pocket coil mattress (width 120 cm, semi-double) of US luxury bed “Simmons”, and enjoy a comfortable sleep. 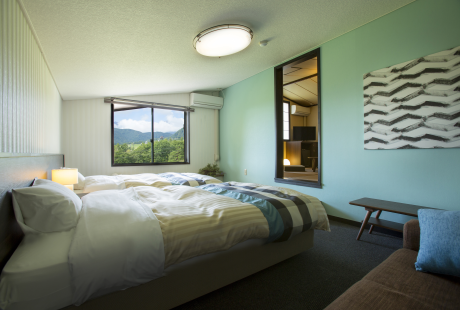 The capacity of the room is 5 people, so futon will be laid on the tatami in the case of two or more people. The rooms in the Northern Alps side are the best view in the hotel. In sunny day, you can enjoy the panoramic view of the Northern Alps, one of the best views in Japan. You can also enjoy the starry sky in a sunny night. Suitable room for a couple, bearing the names of the Northern Alps. Enjoy a relaxing time, watching the view of the Northern Alps. The rooms are most affordable in the hotel, but the services are all the same. The room is located on 4th floor, the top floor of the hotel. We have no elevator, so you need to up and down the stairs for 5 floors from or to the bathhouse. The room has upgraded with new 32-inch LCD TV, refrigerator and renewed spacious full bathroom. We offer the room with relatively reasonable price. You can not choose the view, but all the rooms have the same basic services, amenities and meals. You need to use stairs, so the room is not suitable for elderly person and who cannot walk properly. Please make the reservation on your understanding. Japanese-Western style room with full bath room: 4 rooms, 2-3 people, Twin + living room 28-30 sq. 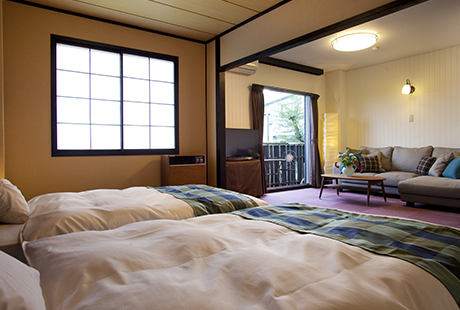 m.
Japanese style room with full bathroom: 3 rooms, 2-5 people, Japanese room 12.5 tatami mats 33-35 sq. m.
Japanese-Western style room with toilet: 6 rooms, 2-5 people, Twin + Japanese room 30-35 sq. m.
Western style room with toilet: 2 rooms, 2 people, Twin room 17.5 sq. 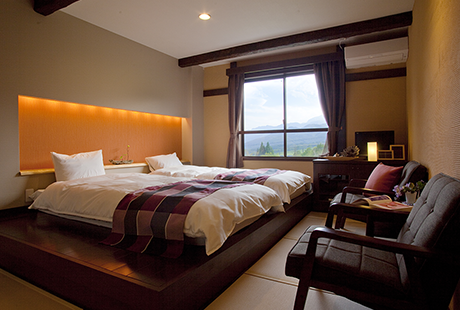 m.
Japanese-Western style room with full bathroom: 3 rooms, 2-4 people, Twi + Japanese room 30-35 sq. m.
Bath towel, hand towel, toothbrush, yukata (Japanese bathrobe, for adult only), hand soap, tea set.